I had a pretty little jar of star anise in my magnetic spice containers for heaven knows how long. I was sure it was mostly for looking pretty, or maybe mulled wine in December. How wrong I was. The secret is this: star anise does amazing things to any meat with a good deal of fat in it. This recipe is a dinner time savior. It’s easy, flexible and has a wonderful, glamorous spiciest too it. While it contains mostly flavors that would be categories as Asian, it somehow does not come off that way at all in the finished product. The clincher is the carrots. Just for a little backstory, when I was growing up, I had an Auntie Norine who went to discos and traveled and I thought was very glamorous. I remember me night she had a dinner party where she did these carrots in butter, cinnamon and brown sugar. I though she was mad, but the way they tasted was pure 80s solid gold dancer. When you get everything roasted together with the chicken schmaltz and 5 spice, you get a hint of what those cinnamon carrots taste like, but maybe in a slightly more modern way. This is the easiest path to winter food Valhalla. Stick all the marinate ingredients and chicken in a large ziptop plastic bag, squidge everything around and stick into the fridge with a plate under it for at least a few hours, but up to two days will do nothing but good to it. 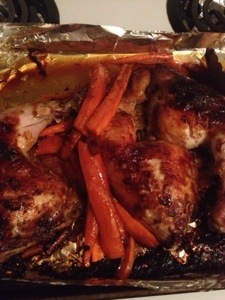 Lay chicken on a double layer foil lined baking tray that had been oiled and cook in a 400 degree oven for about an hour. Half way though cooking time, add in the carrots. Sprinkle over the 5 spice powder and give everything a toss to coat the carrots in the cooking juices and spice. It’s done when everything is bronzed and crispy skinned. Might I also recommend using this same marinade on some nice pork ribs? Thought I could twist your arm.